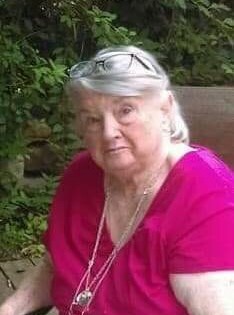 Wendy Bema Mead Lowry beloved wife, mother, grandmother, and great grandmother died peacefully at home after a brief illness. She was born in Plattsburgh,NY to John and Margaret Mead on Sept. 8 1935. She attended Marywood Seminary and graduated from Marywood College. After graduation she taught the severely and profoundly mentally and physically challenged until she retired from the NEIU 19. She was an active volunteer all her life working at the Geisinger Medical Center gift shop and the Theater Group until she became ill.
She is survived by George her husband of 60 years; children Martin, Lisa, George and Margo as well as eight grandchildren and twelve great grandchildren. A celebration of Wendy’s life will be held Friday at 7pm in the Vanston and James Funeral Home 1401 Ash St. Scranton. Friends may call Friday from 6-7pm. Arrangements have been entrusted to and are under the care and direction of Robert C. Jones, funeral director. Grandchildren often. I wish I had kept in touch with her. May God take care of her as she enters the gates of Heaven. God bless you and your family. George, Martin,Lisa,George and Margo, thoughts and prayers are with you all. I can still see her in the back of the church shaking her head.. We feel blessed to have known her, Her smile lit up a room. I pray for you all the best, love and healing energy to you all. It’s Shirley Zindle–So sorry I couldn’t say a final goodbye to Wendy. Earlier today I had a test with anesthesia and can’t drive for 24 hours. Also my son Mark has to work early. All of you are in my prayers. God Bless Wendy and no problems! George and family, I send my sincere condolences. I had worked with Wendy at the IU. She was always very nice to me, and that meant a lot to a traveling Speech Therapist. I felt really badly when I saw the notice at Actor’s Circle. Sending love & prayers to you and family.